Nature~s little helpers have never looked so cute! 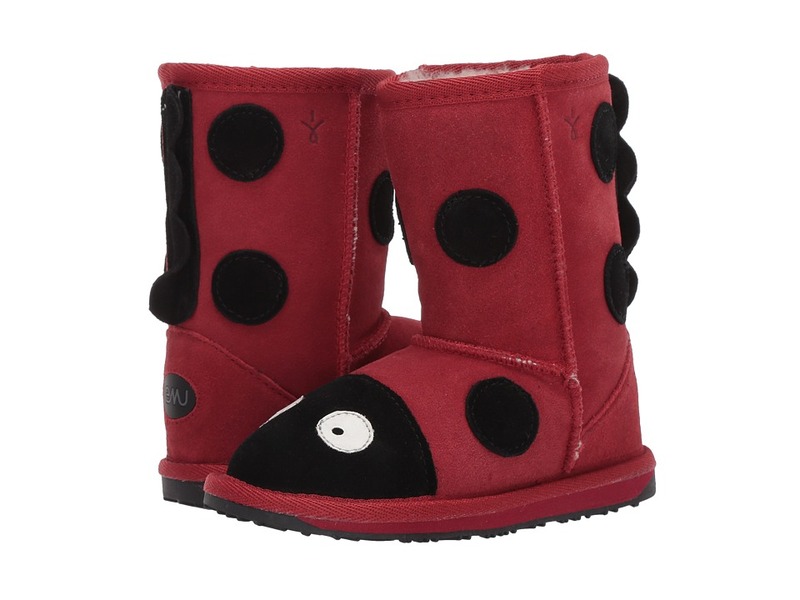 Suede upper with either buzzy bee or loyal lady bug details. Double-stitched seams for added strength. Merino wool lining is breathable and keeps your feet perfectly warm in the winter and cool in the summer. Suede heel cup for added comfort and support. Durable emusole&amp#8482 rubber outsole for indoor/outdoor use. Measurements: Heel Height: 1 2 in Weight: 8 oz Circumference: 11 in Shaft: 6 in Platform Height: 1 2 in Product measurements were taken using size 8 Toddler, width M. Please note that measurements may vary by size. Weight of footwear is based on a single item, not a pair. 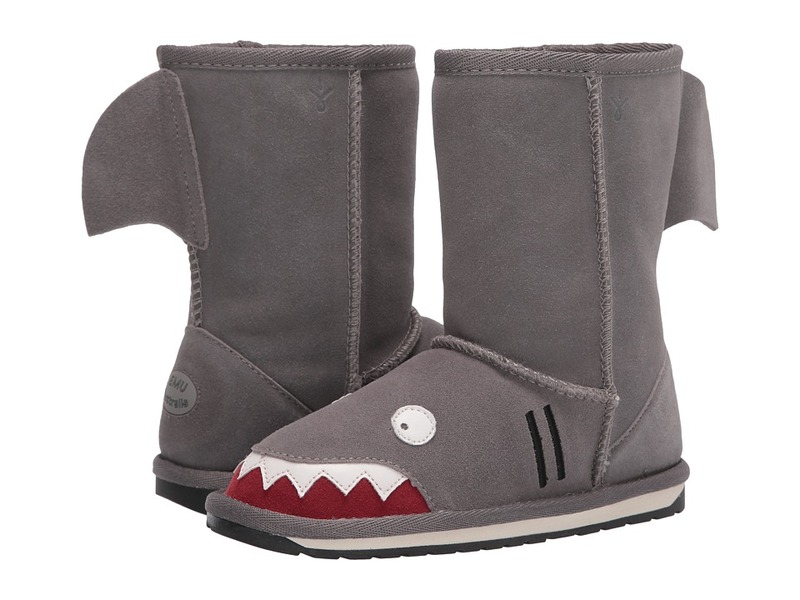 Be warm and sharky with the EMU Little Creatures Shark. Premium suede upper with applique shark details. Merino wool naturally wicks away moisture which provides odorless footwear. Slip-on style for easy on and off. Double-stitched seams for improved durability. Cupped suede leather heel for added comfort and support. Textured emusole dual density EVA outsole perfect for wear indoors and out. Imported. Measurements: Heel Height: 3 4 in Weight: 8 oz Circumference: 11 1 2 in Shaft: 6 1 4 in Platform Height: 1 4 in Product measurements were taken using size 9 Toddler, width M. Please note that measurements may vary by size. Weight of footwear is based on a single item, not a pair. 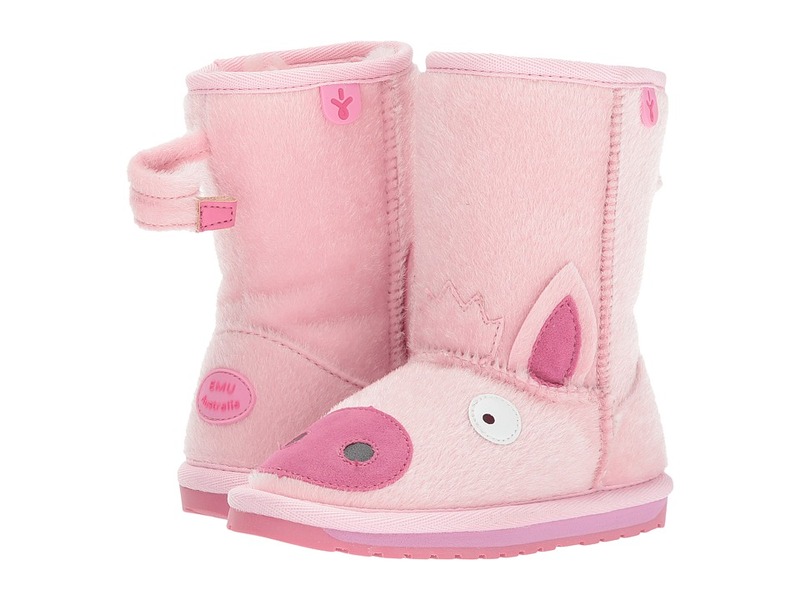 Snuggle up with the adorable Little Creatures Piggy boot from EMU Australia Kids. Faux pony hair upper features pig ears, snout, and a curly tail. Easy pull-on construction. Merino wool breathes and keeps your feet perfectly warm in winter and cool in summer. Soft EVA footbed for all-day comfort. Flexible TPR outsole. Superior double stitched seams for added strength. Imported. Measurements: Heel Height: 3 4 in Weight: 6 oz Circumference: 11 in Shaft: 6 in Platform Height: 1 4 in Product measurements were taken using size 8 Toddler, width M. Please note that measurements may vary by size. Weight of footwear is based on a single item, not a pair. Make every day adventurous with Little Creatures Dragon from EMU Australia Kids! 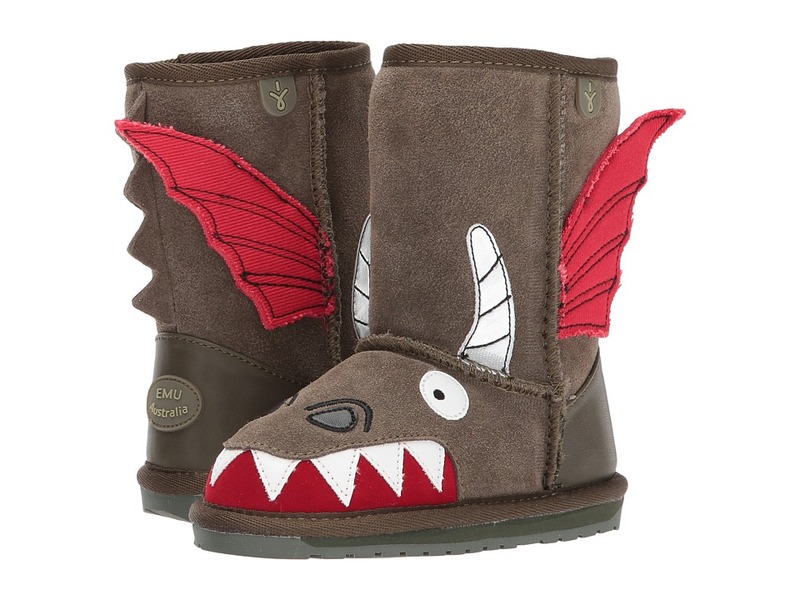 Soft suede upper with fun dragon applique details. Easy pull-on style. Merino wool breathes and keeps your feet perfectly warm in winter and cool in summer. Cushioned EVA footbed for all-day wear. Reinforced suede heel cup for better fit and support. Soft EVA midsole for comfort and support. Superior double stitched seams for added strength. Durable TPR outsole. Imported. Measurements: Weight: 7 oz Shaft: 6 in Product measurements were taken using size 8 Toddler, width M. Please note that measurements may vary by size. Weight of footwear is based on a single item, not a pair. 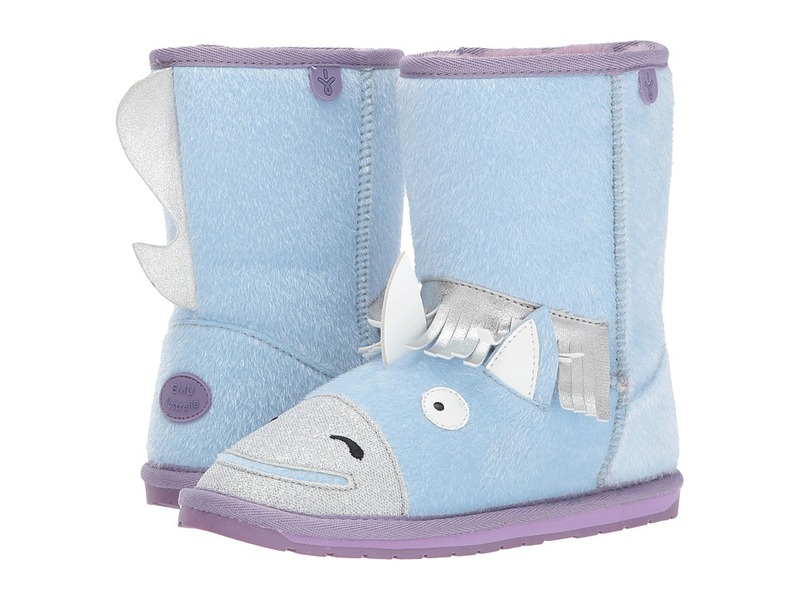 Sparkle and shine all season long with the Little Creatures Unicorn! Faux-pony hair upper with a metallic mane, sparkle face, and horn. Easy pull-on style. Merino wool breathes and keeps your feet perfectly warm in winter and cool in summer. Cushioned EVA footbed for all-day wear. Reinforced suede heel cup for better fit and support. Soft EVA midsole for comfort and support. Superior double stitched seams for added strength. Durable TPR outsole. Imported. Measurements: Heel Height: 3 4 in Weight: 10 oz Circumference: 13 in Shaft: 7 in Platform Height: 1 2 in Product measurements were taken using size 2 Little Kid, width M. Please note that measurements may vary by size. Weight of footwear is based on a single item, not a pair. Step out in wild style with the Warm Creature Sloan sandal. Leather or real dyed pony hair upper. Ankle-wrap tie closure. Open toe. Broad paneled vamp strap. Leather lining. Man-made footbed. Man-made sole. This contains real dyed pony hair from Brazil. Made in Brazil. Measurements: Heel Height: 1 2 in Weight: 6 oz Product measurements were taken using size 9, width M. Please note that measurements may vary by size. Weight of footwear is based on a single item, not a pair. 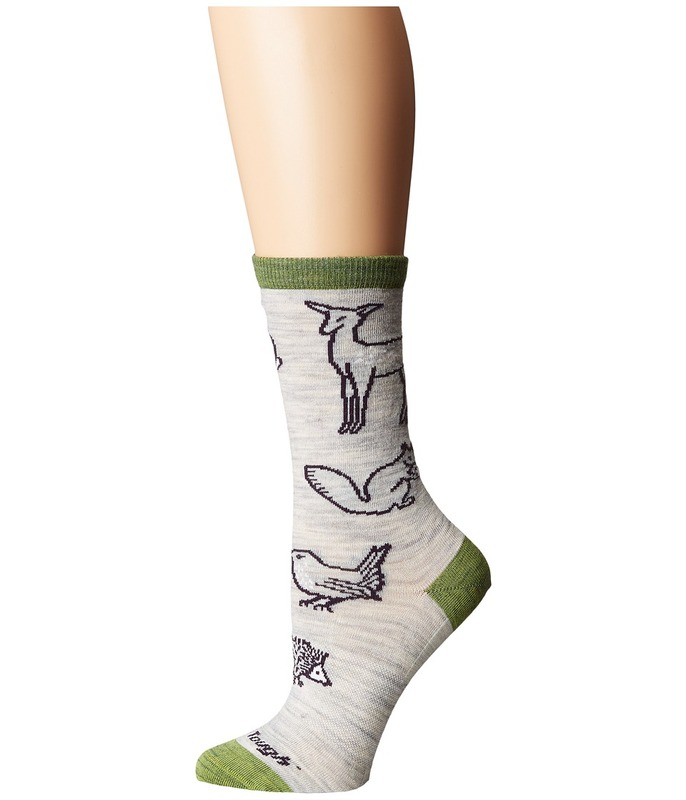 Woodland Creatures wrap your feet in Darn Tough Vermont comfort. Sold as a one-pair pack. Crew-cut sock sits at mid-calf. Performance Fit prevents slipping, bunching, and blistering. Fine-gauge knitting for great next-to-foot feel. Self-adjusting welt cuff. Merino wool keeps feet dry. All weather performance keeps feet cool in the summer and warm in the winter. Elastic arch support. Deep heel pocket. Y-stitch heel. True Seamless toe for undetectable seam fusion and an ultra-smooth feel. 62 percent Merino Wool, 35 percent nylon, 3 percent Lycra spandex. Machine wash cold, tumble dry low. Made in the U.S.A.